↑ Bondanella, Peter E. (2001).Italian Cinema: From Neorealism to the Present. Continuum. p. 13. ISBN 9780826412478. ↑ Bondanella, Peter. Italian Cinema From Neorealism to the Present. The Continuum Publishing Company: New York, 1995. p. 19. ↑ Steimatsky, Noa. The Cinecittà Refugee Camp (1944–1950). October Spring 2009, No. 128: 22–50. ↑ Michael Day (December 13, 2013). 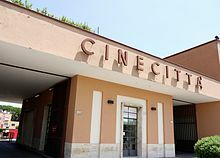 "Decline and fall of Rome’s cinematic empire: The end for Italy’s famed Cinecitta studios?". The Independent. ↑ "Fire torches film sets at Rome's historic Cinecitta". Canadian Broadcasting Corporation. 2007-08-10. Retrieved 2009-04-25. ↑ "Incendio a Cinecittà: le fiamme avvolgono lo storico Teatro 5" [Fire at Cinecittà: flames surround historic Studio 5] (in Italian). RomaToday. July 12, 2012.